There's this new type of black metal out there, it's not quite black n roll, but it should be called that - at least for naming conventions. I'm talking about the bands who focus on a different side of rock music, rather than adding grooves a la Carpathian Forest I'm talking about bands like Tribulation, who bring in their own twisted ideas of what makes truly great rock music. Cloak fall into this latter category with their unique brand of Atlanta black metal bringing in more than a little of this rock and roll magic. What's truly exciting about Cloak to me is that this band has a very real emphasis on songwriting. 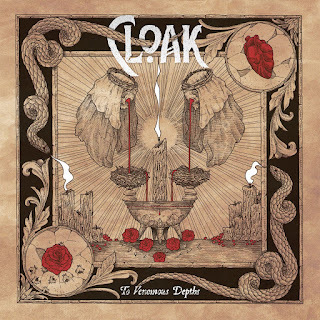 There are powerful and poignant progressions here, a slow growth moment by moment as Cloak become the band they were always meant to be. There is something strangely fascinating about the way that this band puts songs together and there dedication to developing music that is truly powerful and passionate. To Venomous Depths brings so much to the table it's impossible to truly wrap your head around all that it states in just one or two spins, you need to step back and really sink your teeth into all that it means. The magnitude of the compositions means that Cloak address a huge swath of the metal community with their music but are still able to create something unique enough that you don't want to just poopoo it as 'another atypical black metal record'. This is something that you can really get behind, that addresses tropes of the genre but does it in a way that is fairly novel and is building on an exciting new branch of the music. Cloak are rising fast and it's hard to separate yourself from the beauty they have curated. I was basically looking for word press articles that could offer assignment help thanks to this article that actually enlightened me about an professional writing service that works with professionals to offer help to students.